Prom is a special night, and you deserve a special dress. However, finding a gown that makes you feel like a princess can be an expensive undertaking. Some prom dresses can cost from $200 to $400, or more. Even if you have a job, that's still a lot of money. Luckily, if you know where to look, you can look fabulous on prom night without breaking the bank. Some stores never fail to offer a variety of styles for budget prices. Whether you want classic, trendy or something in between, with a little digging, you can find the perfect dress. A halter lace a-line dress for less than $110. This v-neck, lace skater dress in cream for a flirty, feminine look retails for less than $50. This blue, floor length cold shoulder gown retails for less than $100. This party-perfect ruffled high-low strapless dress will have you standing out in the crowd for less than $100. Modern yet simultaneously classic, this sequin mermaid gown makes a subtle, yet high-impact statement for under $100. Kohl's is ideal for the girl who is looking for a relatively casual look. You will not find high-end dresses at Kohl's, however for the budget conscious prom-goer, Kohl's could be a lifesaver as most of the dresses are under $100. You can find trendy styles here, from asymmetrical minis to longer a-line dresses. Short and cute, this sparkly mock neck shift dress is a bargain at under $50. If you're going for sublte glamor, try this strapless floral maxi dress retailing for under $100. The tulle hem on this Trixxi dress turns an LBD into a knockout number, all for under $70. You'll look sophisticated with this Chaya embellished taffeta dress, which retails for just under $150. For decades, David's Bridal has been the go-to place for bridal gowns and bridesmaid's dresses. However, this wedding store has a great selection of elegant prom dresses. 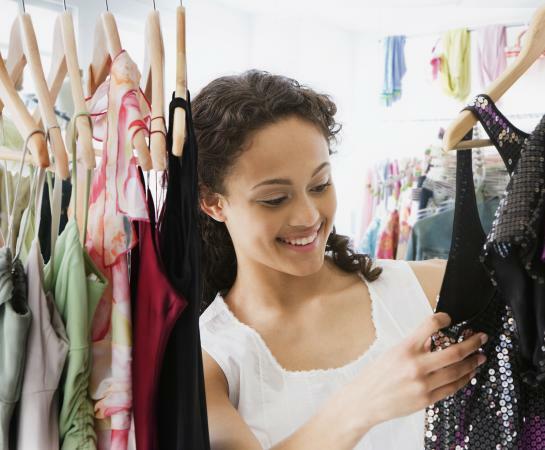 A bonus of in-store shopping here is the personal attention you'll get while trying on dresses, as well as the expertise of someone who's experienced in finding that perfect look. They also offer a larger variety of formal wear than most stores. This two piece lace prom dress combines chiffon, lace, and an infinity neckline for a fairytale look for less than $140. Look gorgeous and classy in this full-length, strapless chiffon dress for less than $100. Look sassy and upscale in this halter pleated dress with a beaded waist and neck, which retails for less than $100. If you're wanting to make a statement without breaking the bank, Go Jane may be the store for you. Go Jane features outrageous styles and colors you wouldn't find in other stores. They also take the cake for inexpensive finds. This strapless cut-out dress with illusion panels on the side is a show stopper to say the least, retailing at under $40. Embrace your funky spirit in this black high low number with a large flower print, guaranteed to be a winner at under $50. This ruched maxi dress with plunging neckline is a total stunner and retails for less than $40. So what do you do if your budget is non-existent? While finding your prom dress might be tricky, there are still a few ideas that might save you major dollars. Get a little creative and you may just find your perfect dress for free or very little. Most girls usually wear their prom dresses only once and then leave them to hang in the back of the closet. Many styles stay the same over the years and borrowing a dress is the cheapest way to still look great. Your only expense is your matching accessories and dry cleaning the dress before you return it. Don't just confine your search to prom dresses. Often bridesmaid dresses fit the bill as well. If you know of someone who was in a wedding recently, ask if you can borrow their bridesmaid gown. Operation Prom is another organization that collects gently used prom dresses and redistributes them to girls who are in need. To qualify, you have to fill out a registration form online and agree to their terms of service. With all of these choices, there is no reason to avoid going to prom just because you're short on cash. No one, including your prom date, will guess you didn't spend a lot of money, as you'll look like you went shopping for haute couture. Only you will know you spent more time than money to look like a million bucks.